1。 Place ingredient (A) into a large mixing bowl,stir well till batter is smooth. Strain through a sieve, rest for 30 minutes. Add in ingredient (B) and mix in well just prior to fry crepe. 2. Heat a non-stick pan over medium heat till the pan is hot with a slight smoke seen. Scoop up no. (1) and pour a little batter into the pan tilting it so that just a thin layer batter covers the base. Pour off any excess batter back into no. (1). 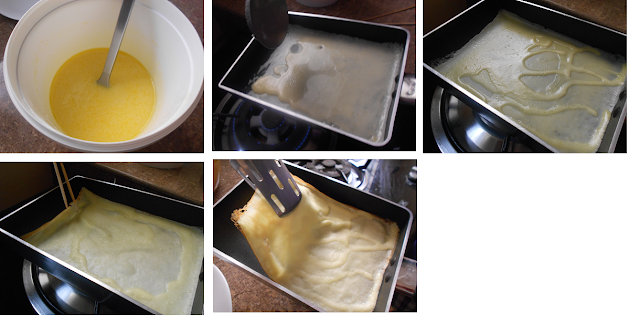 Cook crepe till under side has set. 3. When the edge turns to a pale golden,use a spatula to ease it away from pan. Use your hand and carefully lift out the crepe. Lay the cooked crepes in a container while you cook the remainder. (Remember,you must stir well before each scoop or else batter can thickens on standing . If this happens, dilute it with drizzle of water.) Repeat process to the end. 2. For filling : Place ingredient (A) into a large mixing bowl,beat till thickened. Add in thickened ingredient (B),mix well,set aside (keep chilled if it is not needed immediately). 3. To assemble : Lay cake board on the turntable. Place 1 piece of crepe no. (1) on it. Spread a thin layer of no. (2) on top. Stack on another piece of crepe no. (1). Lightly flatten with your hand along the centre point (this help s the cream to sit better). Next, spread on a thin layer of no. (2), repeat process to the end. Clingfilm well, keep cake chilled overnight. This is really hard work and I had wanted to make this for a long time but just don't have the time to do it. Have bookmarked this. Me too, I had wanted to make this since last year ,but dare not do it until today I work together with my dear daughter. Hi. May I know which non-dairy fresh whipping cream did you use? My cream turns out to be too soft. I was using "Toppin' Pride" as whipping cream. you may refer pic above. Hi, I do tried others recipe previously, but turned out oily, even I don't oil the pan. May I check is your recipe is oily? the crepes should not be too oily right? No, is not oily. The crepe turn out just rigt. Easy to assemble. Hi morning, thank you for your sharing! Let me try and update you.